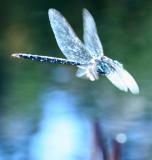 Donna Hollinger | all galleries >> Vermont Images, Eccopond >> Dragonflies and Damselflies in Vermont > Canada Darner? Wow! Nice! You must have been very patient for this. Excellent, Donna. One day I spent at least an hour trying to make this kind of capture with my 20D and 300mm lens. You did it well...it isn't easy. Amazing. I bet it gave you a tingle at the back of your neck when you saw this result!